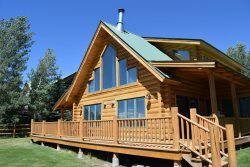 4 Bedroom, Luxury Home in the Town of Crested Butte- Sleeps 9! I thought all the verbal communication was friendly and thoughtful, i appreciate that! My husband met Kate who brought by the coffee maker and said she was very kind and professional. He has Parkinson's disease and he said he was shaking like a leaf :) and she wasn't Phased at all. thank you for that Kate. Every one of our guests was relaxed, happy and comfortable in this house. Our guests were so thankful to have such a beautiful house to stay in and a gorgeous place to visit. All of them want to come back to do more hiking and biking. IT was a beautiful and amazing house. Beautiful property, excellent, well appointed home accommodations. Great location near to town but not in the center of the bar area. Definitely would stay there again.